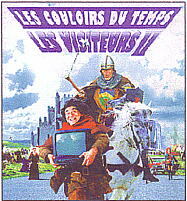 Le couloirs du temps (1998). Aka... The corridors of time. A succession of blows stops the preparations of the marriage of, Godefroy de Montmirail and Frenegonde de Pouille. One comes from derober to the duke, who is the father of Frenegonde. The dentelette of Sainte-Rolande, a sacred relic which ensures fecondite to the women of the family of Pouille like all her jewels, has disappeared. It is, Jacquouille and Ginette, which made this larceny and are left in the present. If there is still to be a marriage, then there remains but one solution, and that is for, Godefroy, to set out again in present, recuperate the jewels, the dentelette and Jacquouille the rabble.